The Society has been monitoring this demolition since the summer, note the delicate mass of steel rebars to the right. Local campaigners have been fighting to stop Spitalfields Market’s 1929 London Fruit Exchange (LFWE) from being redeveloped. However as this shows it is now nearly completely demolished, only the facade on Brushfield Street opposite the market still remains. The Society is always on the look-out for unusual rubble formations. London’s housing crisis at ’The Poor Door’ on 10 October 2015. Tinsel has said: The title was inspired by the furore over the development at One Commercial Street in Aldgate, which was built with two separate entrances. Luxury marble floors, chandeliers and concierge for the wealthy city workers, and a side-alley door for the ‘affordable’ housing tenants. The Poor Door is a growing trend in new housing developments in London, this divisive phenomena seems reminiscent of the Victorian era. 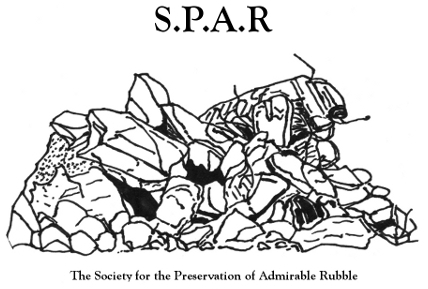 This entry was posted in Uncategorized on December 9, 2015 by Society for the Preservation of Admirable Rubble (S.P.A.R).